With the Summer entering its waning days and SDCC now past us, I thought I might try my hand at an regular/irregular column, taking a stab at comics that interest me. And maybe you. Because I'm lazy, I'm not bothering with cover art or anything of the sort. Hey, it's my article, I can do whatever I want! 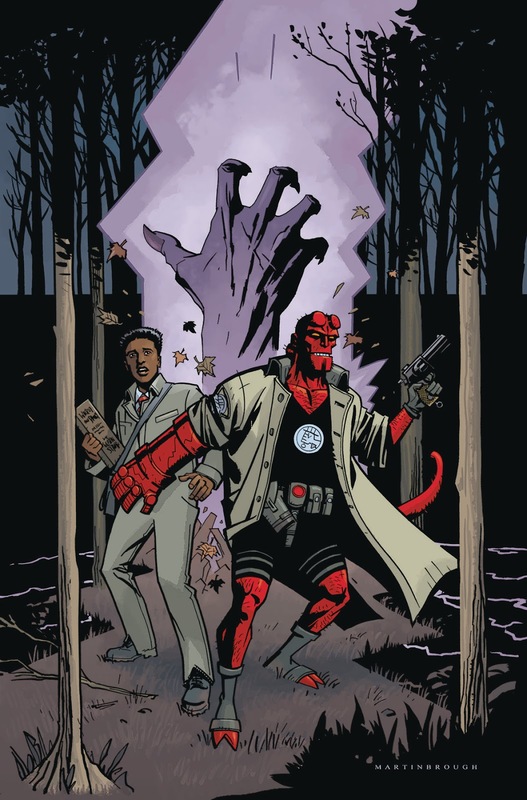 Hellboy and the BPRD 1955: Secret Nature - Another Roberson co-written Hellboy comic. His current tenure as the flashback/continuity guy for this property has been a little mixed, with both good (1953, The Visitor) and less satisfying entries (1954, Rise of the Black Flame). But I'm never not going to be curious about a Mignolaverse comic. This is a one-shot. Mister Miracle #1 - The reunion of Tom King and Mitch Gerads, the latter is one of my favorite current artists - whose approach reminds me of a cleaner Alex Maleev, an appeal which may only be mine, but I do enjoy it quite a bit. Their last Batman collaboration was a hoot. Justice League of America #12 - Steve Orlando is one of the better dialogue writers in superhero comics, and this issue brings back Ivan Reis and looks to be a fun tribute to the old Sword of the Atom concept. Sign me up. Kill Or Be Killed #11 - I'm way behind on this Ed Brubaker/Sean Phillips opus, but what I've read up to finally got its hooks into me with its 7th and 8th issue. Worth a look, as always. The Wicked & The Divine #30 - I'm also behind on this, but I'm sure it's still good, which they've all been - except for that magazine issue. Marvel True Believers Specials - Marvel's last-minute Kirby anniversary effort is worthy of note just because of the sheer appeal of the material it reprints. This week it's a selection of giant monster stories, one of which features star of the big-screen Groot, and another pair representing some really fun Thor comics. For a buck each, you can't lose. Palookaville #23 - Seth finishes off Clyde Fans and keeps on with an autobio story in the backend. Great low-key cartooning as always I'm sure. Neonomicon h/c - On the "let the buyer beware" front, here is Alan Moore and Jacen Burrows' prequel to their widely praised Providence. It's well-written, as most Moore things are, but it's also pretty gruesome and hard to bear - far moreso than the majority of his catalog. It's the only comic I ever returned to the store for fear of having it on my shelf. But you may be more risk-averse than I.